We are bringing a new feature to the blog this year—a series of interviews of our own family here at Health Foundations. We hope this will allow our prospective and current clients to get to know us a little better. We know that it can be hard to choose a care provider based simply on the credentials that come after one’s name or from a basic biography—hopefully this will give a sense not only of who we are as professionals, but who we are as people. We feel so privileged to get to know each and every one of our families and we want you to feel like you know us a bit too. The first member of our team we’d like to introduce on the blog is Monica Liddle, one of our fantastic midwives. 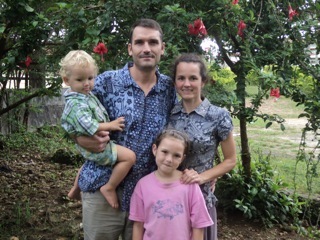 Husband Tom, who is currently getting his Masters of Divinity at Luther Seminary, and two children Hannah (born 2004 in Duluth, MN) and Simon (2010 in East Timor). I am a licensed midwife and a naturopathic doctor. I provide comprehensive maternity care to women in the childbearing year, including prenatal, labor and delivery, and postpartum care. I also play a supportive role in naturopathic medical care for our patients. I received my BA from University of Arizona in Tucson in 1994. I received my degree in interdisciplinary studies in a combination of Women’s Studies, Modern Dance, and Creative Writing. I received my Doctorate in Naturopathic Medicine in 2002 and my Certificate in Naturopathic Midwifery in 2003, both from Bastyr University in Seattle, Washington. This is where I met fellow midwife and Health Foundations owner Amy Johnson Grass. I was born in July 1971 in Columbus, Indiana. I am the second child in my family. My mom had a pretty straightforward seven-hour labor with me and had a normal spontaneous vaginal delivery (NSVD) in a hospital. It sounds like you’ve lived in quite a few places, where have you lived beside MN? I’ve lived in lots of places, including Indiana, Arizona, North Carolina, Washington, Duluth (Minnesota), and East Timor, an island nation in Southeast Asia. I moved to the Twin Cities in 2013 with my family and am happy to be back in Minnesota. I love reading stories to my kids. That has to be one of my favorite things to do with them. Bedtime reading includes Dr. Seuss and Busytown Books (the Cat Family) for Simon. Harry Potter is Hannah’s favorite. If you could get on a plane tomorrow and travel anywhere in the world where would you go? I would definitely travel back to East Timor—I have many friends and loved ones there, not to mention, it’s warm and sunny!!! I would want to fly! And I would probably fly myself to East Timor, as mentioned. Okay, lets get into your midwifery practice. What inspired you to get into your field? At the very beginning of my naturopathic medical program at Bastyr, I participated in a new student orientation interest group session on the midwifery program. I wasn’t necessarily considering it before, but as I listened to the midwifery program advisor talk about natural childbirth, I was struck by how clearly birth was central to the naturopathic philosophy of health. Namely, that natural birth strives to avoid unnecessary interventions in the birth process, and that solid foundations in good nutrition and positive self-care can and do support a woman’s ability to have a healthy pregnancy and birth, and a healthy newborn. It took many months before I could actually pursue this path (after my general naturopathic curriculum), but once I began the midwifery program and started attending births, I really loved it. It was interesting to see how the program “thinned out” as fellow students began to realize the lifestyle commitment required of midwives (namely the 24/7 on-call commitment), but this didn’t dissuade me from pursing this line of work because of how important I believe midwifery and natural health care to be. In addition to midwifery coursework, I spent 9 months after completing my ND program working with naturopathic midwives in Seattle. Naturopathic midwives are those of us trained at US Department of Education-accredited naturopathic medical schools with doctoral degrees in naturopathic medicine AND specialty training and certification in comprehensive maternity care. 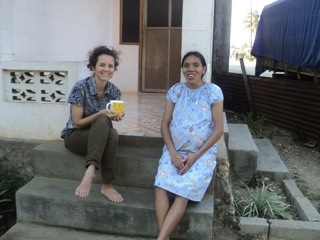 The final piece of my midwifery training in 2003 was at Bairo Pite Clinic in East Timor, working alongside Timorese midwives. Actually, when I think back to my introduction to midwifery at Bastyr, I think the reason that it resonated so much to me is because of my experience in women’s studies as an undergrad. I felt like my eyes had been opened to the world through women’s studies. And then along came midwifery, and I was struck: midwifery in America is truly “radical health care for women.” While those of us who practice midwifery in out-of-hospital settings are considered “outside the box” by American standards of maternity care, there are things to keep in mind. For example, midwives are the primary providers for childbearing women worldwide, and out of hospital settings are the norm in many places. 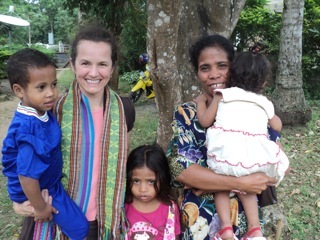 In East Timor, over 70% of deliveries happen at home in this very rural country, and most women don’t have access to competent medical or midwifery care. Finally, here in the US, the research bears the truth: midwifery care by trained providers both in and out of the hospital is without question a safe option for low risk women with the benefit of less interventions, good outcomes for mothers and babies, and more personal attention for individual women. What do you love about Health Foundations? What is your favorite part of your job? I love working with women who are committed to serving other women with care and commitment. And, I love when first time moms have that moment: “Oh !*%?! I can’t believe I am doing this!!! !”….and then they do it! I feel like giving birth is a natural part of a woman’s life. In the work I do with midwifery care, I feel like I am honoring that most essential aspect of womanhood. And it’s really important for me and always has been to see birth as an opportunity to empower women because when women are empowered through birth, through giving birth, it can change their lives. I love to witness the diversity from which Health Foundations families come, and with similar intent: for an empowering, natural birth. What do you wish all HF families knew? What advice or wisdom can you share with pregnant or new mama readers? Honor yourself and your baby.